Destiny. 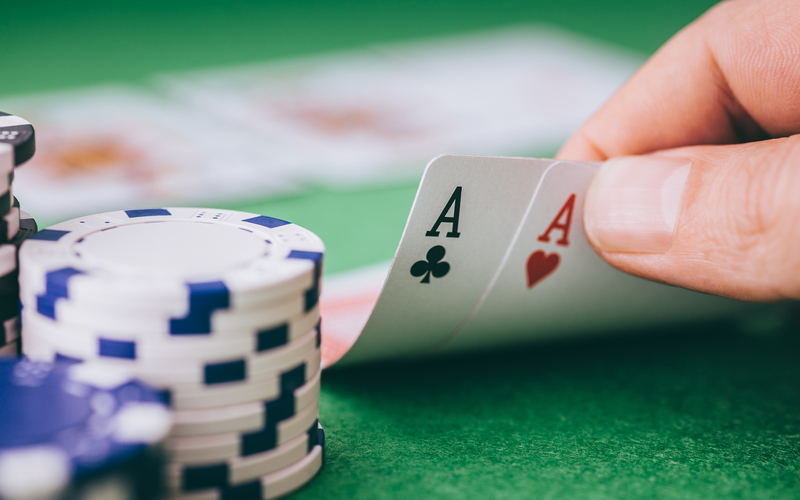 Can one really be destined to be a poker champion? As if somehow the universe requires it to be so, and free will or bad luck cannot interfere? 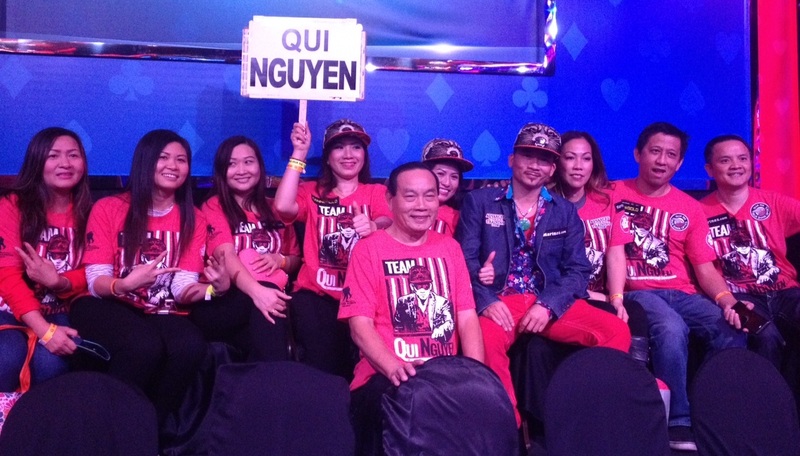 I know it seems overly dramatic to say this, but somehow deep down, I don’t think any of us had any real doubts that Qui “Tommygun” Nguyen was going to win this thing. It just seemed like this story had been written long ago, and nothing could change that. This story begins for me about a month ago, when I got an unexpected call from PokerNews.com. They asked if we could use the patented software on my website, AdvancedPokerTraining.com, to write computerized representations of the remaining players, and run a simulation of the November Nine. So I began the process of gathering all the information I could on each of the nine players — watching face-to-face interviews, and any playing history I could access. We published the surprising results in a series of four articles, and the bottom line was this: Qui Nguyen was winning, much more often than he should have been. Vegas had him at 10 to 1, even though he was second in chips. Everyone was calling him the amateur, the wild gambler, and yet… he was winning. 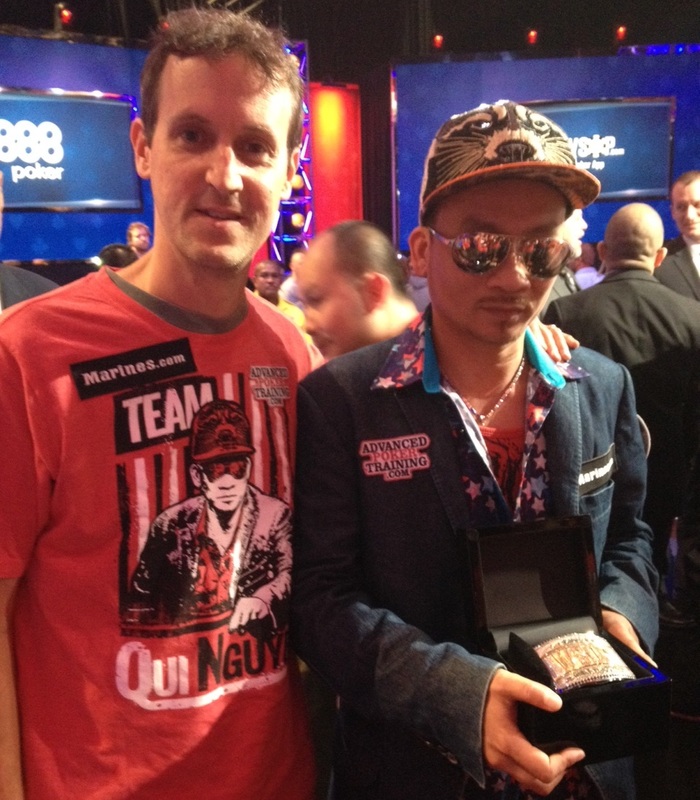 Through our agent James Sullivan at Poker Royalty, I contacted Thomas Nguyen, Qui’s older brother, and a deal was made. They would fly me to Las Vegas, and I would help “TommyGun” prepare for the event, and in return he would wear the AdvancedPokerTraining.com patch on TV. I crafted a special simulation for Qui in which he could play the final table out, over and over again, against digital representations of his opponents. And I continued to run more simulations, making small adjustments to the personalities of each opponent, to determine an optimal strategy. I should have known this was going to be a wild trip when I arrived at the airport and a guy who called himself “Super Mario” was there to pick me up. This turned out to be Mario Orozco, Qui’s manager. 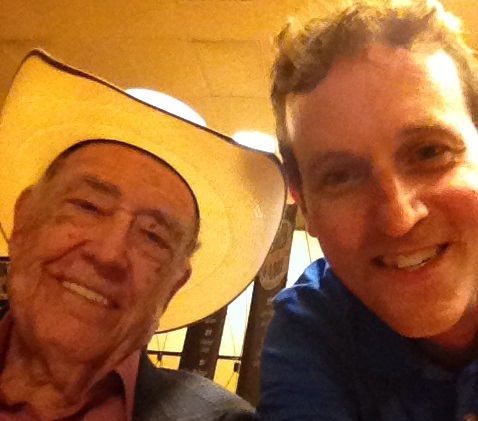 He drove me straight to the WSOP Hall-of-Fame Banquet, which happened to be that night. Within an hour of arriving in Vegas, I was snapping selfies with Doyle Brunson, Scotty Nguyen (no relation to Qui), and new hall-of-famers Todd Brunson and Carlos Mortensen. I even went over to Scotty’s house the next day and played chess with his son – it was surreal. 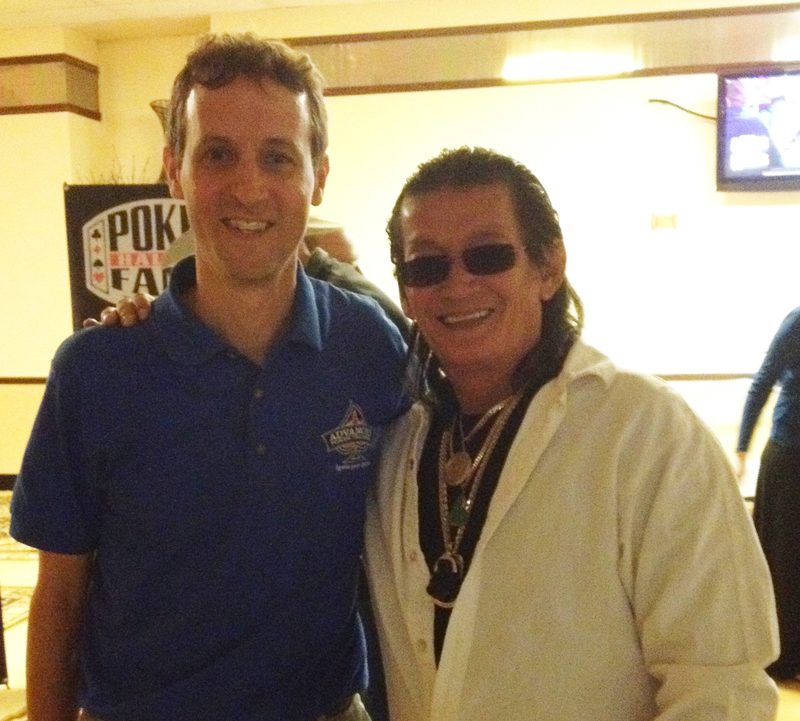 A funny moment: I showed up to meet Thomas the next morning, and he handed me a stack of poker chips. “Here,” he said, “I just bought you into the 10AM tournament, it’s starting now”. 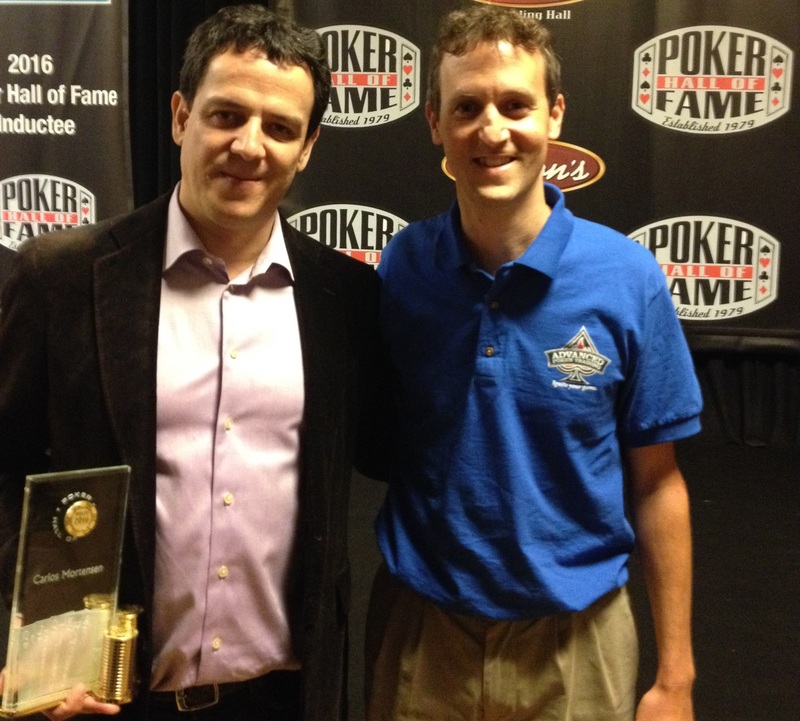 I told my wife Allison this story and she said, “Wow, that’s kind of bold of him, how did he even know you would want to play a tournament at that time?” I explained to her that this is simply good manners among poker players. We poker players understand each other. Of course I would want to play a poker tournament at 10AM. Why wouldn’t I want to play a poker tournament? The next few days are a blur of hanging out with a who’s who of the Las Vegas high-stakes poker crowd. My suite on the 32nd floor at The Palms had a bar, fireplace, a sauna and hot tub in one of the 3 bathrooms, and 7 TVs that I was able to count, although there might have been a few more I didn’t find. Between all the fun and craziness, I got to know Qui Nguyen a little bit. He is originally from Saigon. Some of his family (including his Aunt and brother) left Vietnam for America right after the war, but due to some complex circumstances, Qui wasn’t able to leave the country until 1999. He now calls Las Vegas home, and has a wife and son. Qui is a great person and I really enjoyed getting to know him. He’s not what you’d expect from a high-stakes poker player. His brother Thomas is a retired U.S. Marine and Qui had promised a significant portion of his winnings to the Wounded Warrior Project. In return, Thomas assured us that Qui would have the full backing of the U.S. Marine Corps during the tournament, should the need have arisen. You know, it’s always good to be prepared for anything. 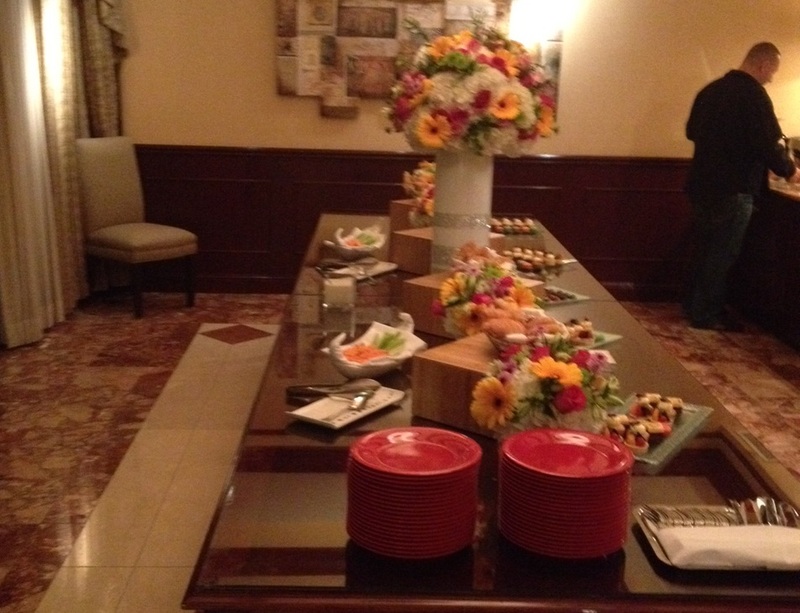 He also donated a portion to Marriage Boot Camp, which besides being a TV show, is a 4 day intensive marriage retreat. I’m told it was originally designed for U.S. soldiers returning from Iraq, who were having trouble readjusting to family/married life after what they had experienced during deployment. A worthy cause indeed! About the Raccoon hat you see him wearing in all the pictures: Apparently it is Rocket Raccoon from Guardians of the Galaxy. Qui wore the hat all throughout the tournament. He even got Norman Chad and Kara Scott from ESPN to wear the hat. 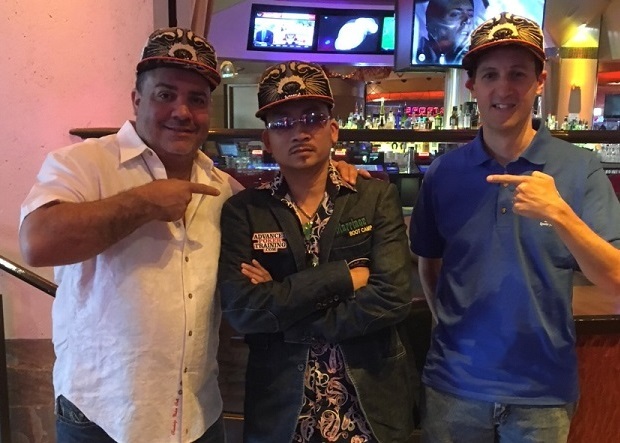 A certain poker site (not mine) offered him $100,000 to take off the hat and wear their logo instead, and he turned them down! This is now his signature accessory. Even Kara Scott from ESPN can’t resist the Raccoon hat! 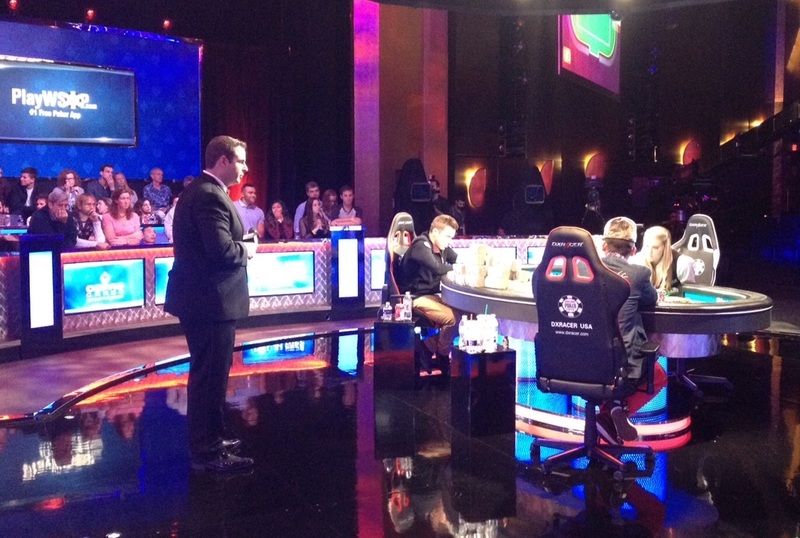 The Final Table is held in the Penn and Teller theater at the Rio. It’s open to the public, although only coaches and family can get backstage behind the rail, with a special wristband. I headed backstage and said hello to tournament director Jack Effel, who is a super nice guy. When the cards went in the air Sunday night, we had some technical difficulties. I was planning to watch the live stream to try to get a read on Qui’s opponents, and to find out what cards they were folding. But we couldn’t get access to it, you needed an ESPN.com password. I had to call my DAD from backstage to get his password, to watch it on an iPad. You know, only $8 million dollars on the line, good thing dad was around! After a rough start, we got everything under control. During breaks, Qui would come over to the rail and we’d talk strategy. 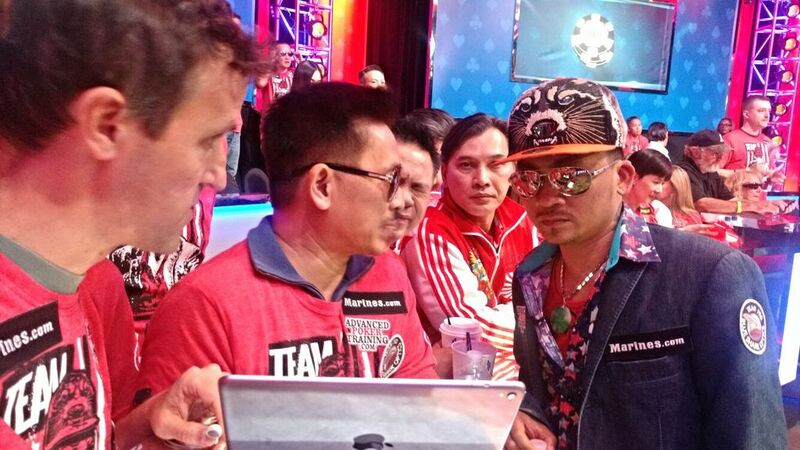 Longtime Las Vegas poker pro Young Phan mostly communicated with Qui in Vietnamese, because he was miked up all the time. As the night progressed, one thing was becoming clear really fast. This kid called TommyGun was the real deal. The simulations had been right, and everyone else was wrong. He wasn’t an amateur, he had exceptional poker talent. The ESPN crew was in awe. 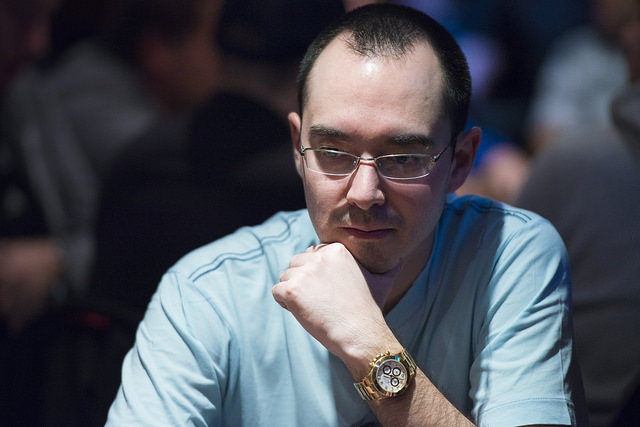 I heard Antonio Esfandiari say that TommyGun was “Dominating the table in every aspect”, and “I couldn’t get a read on this guy if my life depended on it.” During one of the breaks I heard someone (it was either Phil Hellmuth or Daniel Negreanu) remark, “The poker books are being re-written tonight…poker will never be the same”. We played down to five players and then suspended action. I didn’t sleep all night – way too wired. 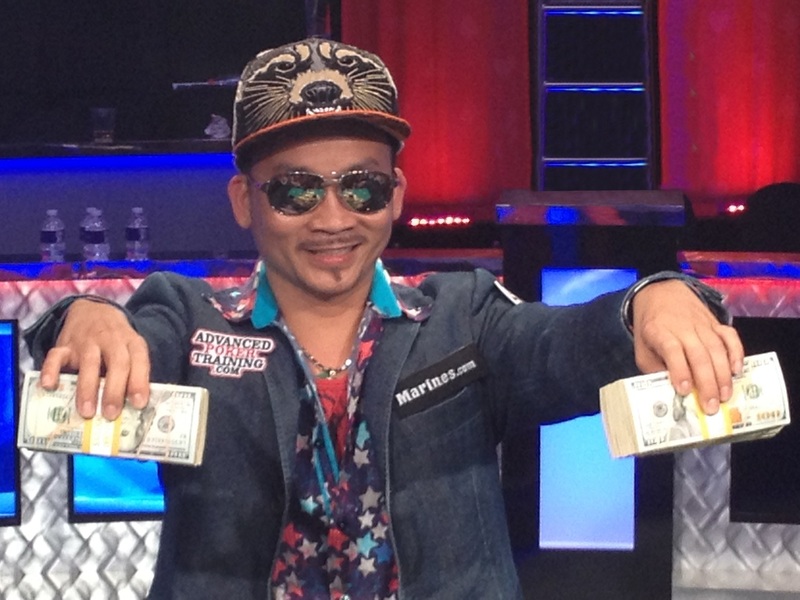 The headline the next day said that Qui “TommyGun” Nguyen was the “Star of the Show” Sunday night. Nothing could have gone better. We had a great game plan, but his poker skills were really underestimated. I barely remember much from Day 2. I felt like an extra from The Walking Dead. Appropriate, since it was Halloween night. 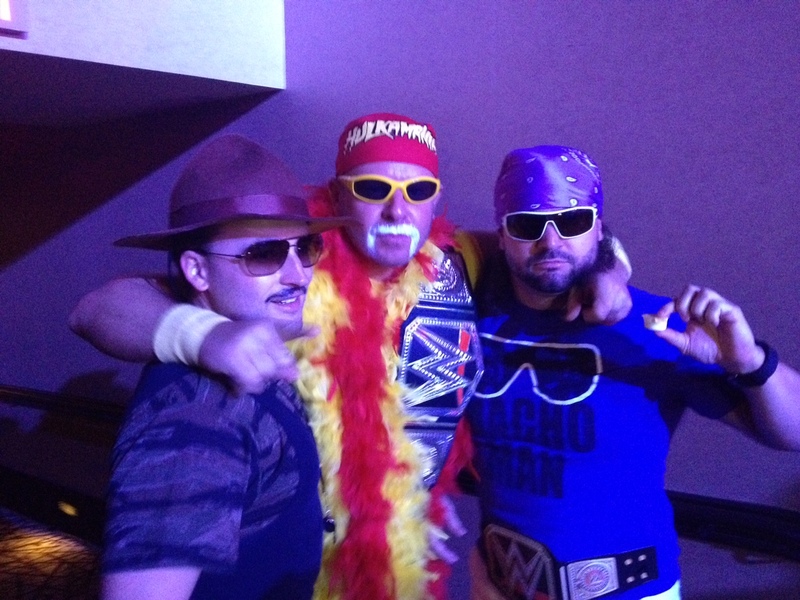 Some of the audience was in costume — I snapped a picture of Sergeant Slaughter, Hulk Hogan, and Randy “Macho Man” Savage, before heading backstage. Fortunately it was a short night. We played down to 3 players, and shortly thereafter Jack Effel called it so we could all get some much-needed sleep. I woke up Tuesday morning, the final day of the event, and my phone was already exploding with calls and texts. Even after some sleep, I felt like I couldn’t take any more of the chaos, so I headed out to somewhere unexpected. For those of you who don’t go to Vegas much, there’s a Catholic Shrine practically right next to the Tropicana Casino on the Las Vegas Strip. It seems so out of place there (or maybe not) — it’s probably the one place you can go on the Strip to get some peace, or perhaps repent if you need to do so! My friend Mary Gail happened to text me right then, and when I told her where I was, she immediately looked up all the Patron Saints of gamblers for me (there were several). I didn’t pray for victory, I just shut my phone off and enjoyed the silence. But I kept having this overwhelming feeling that that night, everything was going to play out pretty much exactly like it did. By now you probably know the story. First Cliff Josephy got knocked out in third place, after only a couple hours of play. Two players to go. It seemed like it was almost over, but the match went on for nearly eight more hours. Everyone was so tired from standing up behind the rail the whole time, we were practically holding each other up. It was the longest heads-up match in the history of the main event. The remaining opponent (Gordon Vayo) kept hitting a lucky card here or there and coming back. But TommyGun wouldn’t be denied the championship. Heads-Up for the World Championship! Both players were clearly showing some fatigue. At some point a bearded man from the audience walked right up on the stage and placed a giant-sized Snickers bar next to Qui. He was immediately escorted out of the building by security (remember, there was millions of dollars of real CASH right there on the poker table). 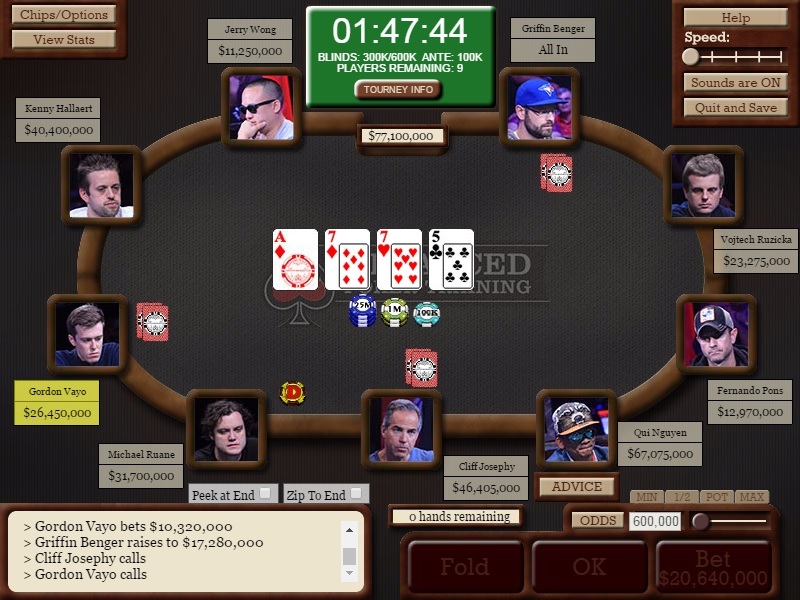 Around 3AM, Vayo finally went all-in with Jack-Ten of spades. TommyGun had him dominated with King-Ten of clubs. When a King came off on the flop, the TommyGun crowd erupted. But it wasn’t time to celebrate just yet, because Vayo had also flopped a double gutter. This time, however, lady luck didn’t save him. No help for Vayo on the turn or river, and the rest is a blur. Confetti started flying through the air. I tried to jump over the wall to get to Qui and maybe tackle him, but after 10 hours of standing there, my legs just wouldn’t work. Finally one of his family members dragged me across (I still have bruises). My wife and kids saw this all on TV, because they were already up getting ready for school on the east coast. There were reporters everywhere and flashes going off; I could barely see where I was going. 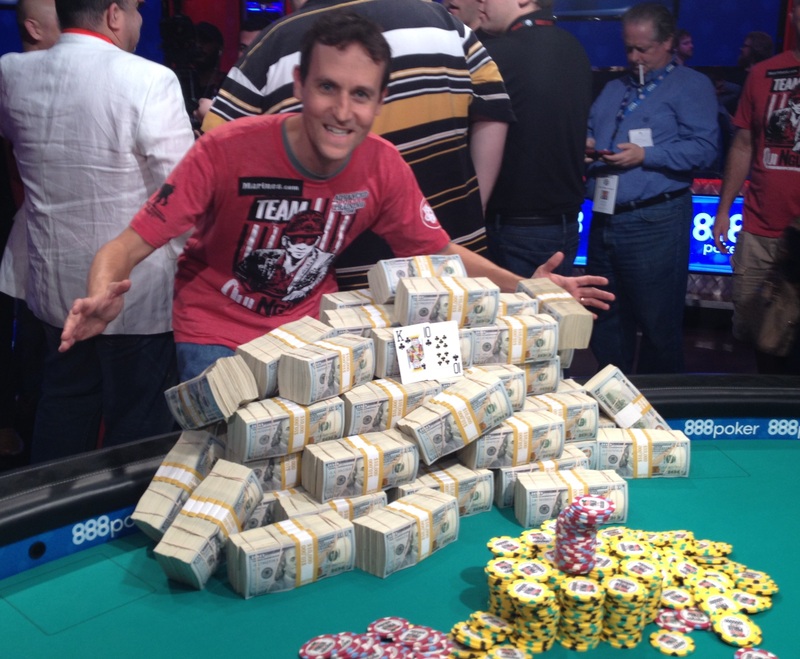 Everyone was jumping up and down, hugging each other, and snapping pictures with the big pile of money. I remember getting pulled into an interview with “Super Mario”. He was telling the reporters about my coaching, and how I was the original one who predicted the win, which was pretty cool of him. The CEO of Caesar’s Entertainment was there, and I remember him offering to take the championship bracelet (loaded with diamonds and valued at $500,000) and put it in the cage for Qui. (The cage is the secure, armed area at every casino where they keep all the money). At some point I got pulled off the stage, and some security guards took me with Qui’s family into what looked like some secret tunnels at the Rio. We walked and walked for what seemed like a mile, and then they hurried us into an enormous freight elevator. 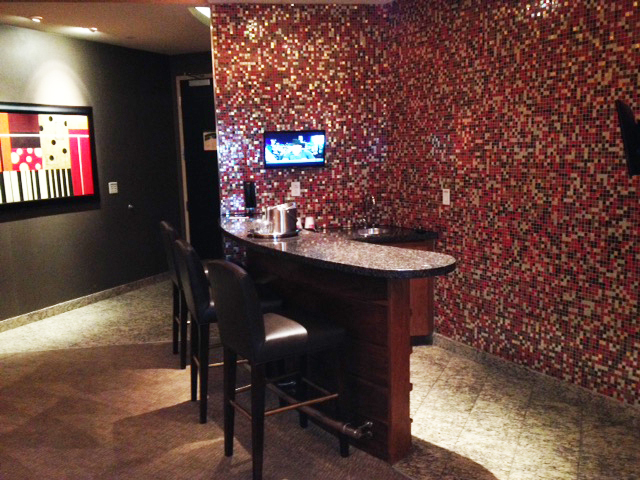 After an lengthy ride, the doors opened and we were on the 51st floor of the Rio, in the Presidential Suite. 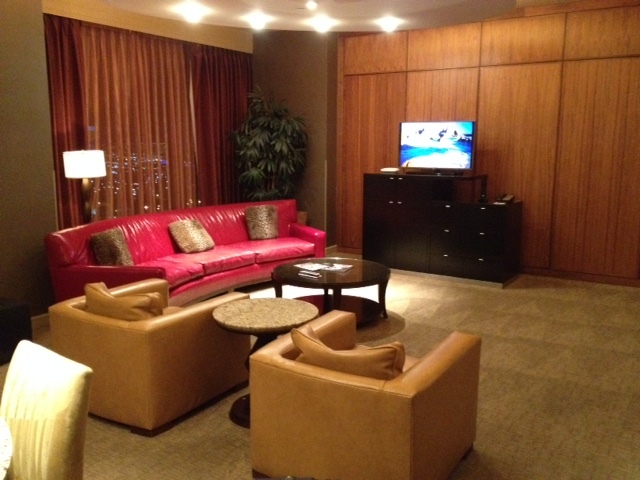 The suite had an enormous balcony overlooking the entire city, with a giant hot tub. I passed on the hot tub because I saw something that interested me even more – FOOD! I realized it was 4AM, and I had had nothing but a strawberry pastry and a banana all day. 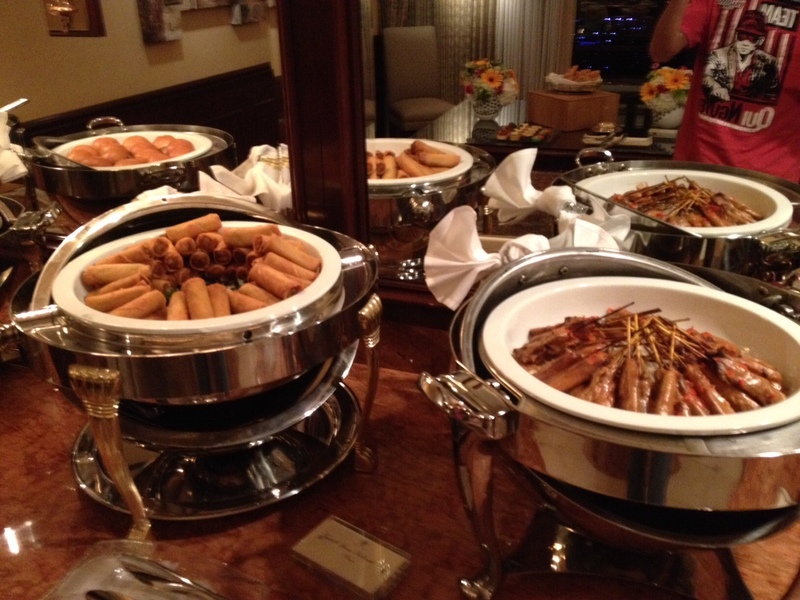 There was an entire room in the suite set up with nothing but world-class food. Mostly Asian food – sushi, pot stickers, Pho (Vietnamese noodle soup) – hmmmm, did even the chefs know that TommyGun was destined to win? 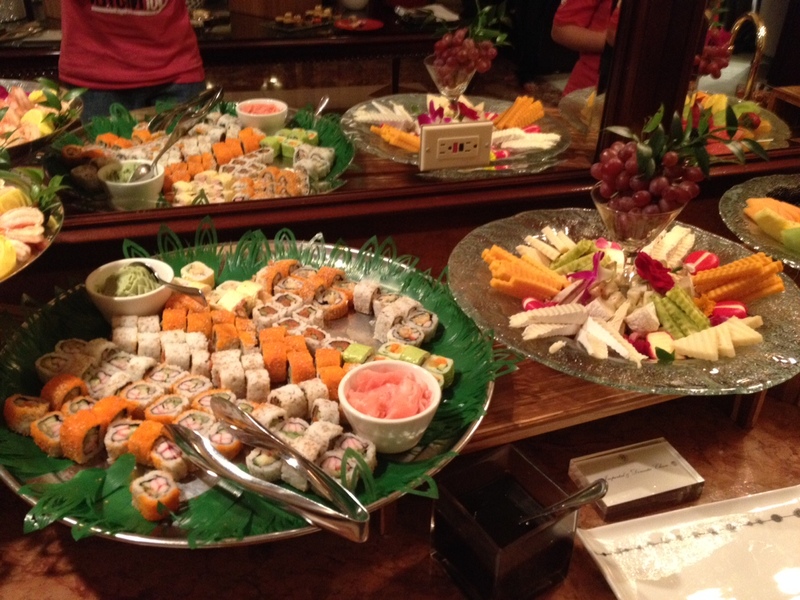 There was a fully stocked bar, and even a butler to arrange for anything else we wanted. To say we partied all night wouldn’t exactly make sense, because the night was almost already over. And everyone was really tired anyway, so the party was a little subdued. I got to have a really nice one-on-one conversation with Qui’s father, and this is one of my secret favorite moments of the trip. He seems like a simple man, a humble man. He said he still spends a lot of his time back in his home country, Vietnam, up to 6 months out of the year. I doubt he was wealthy before. I wonder if he can fully comprehend the 8 million dollars his son just won. I didn’t ever want to leave, but at some point I looked out over the balcony and I could start to see the first signs of light on the horizon. 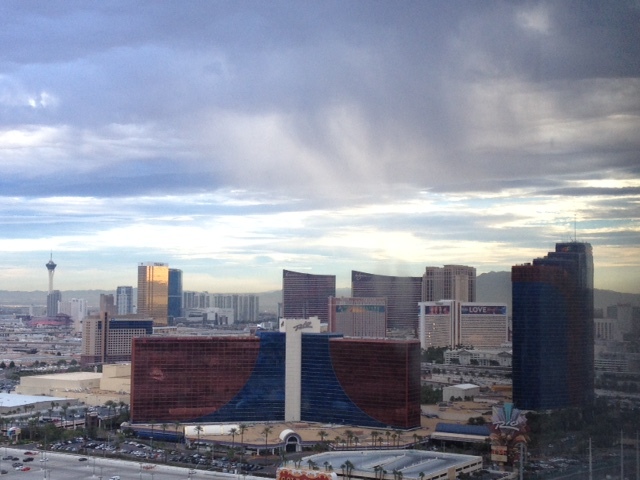 In Las Vegas, the sunrise is the official announcement of “party’s over”. It’s like when you’re in a bar at 2AM and they all of a sudden turn on the lights and start playing “Closing Time”. I’ll end the story here, but what comes next, I have no idea. My website is being bombarded with traffic. 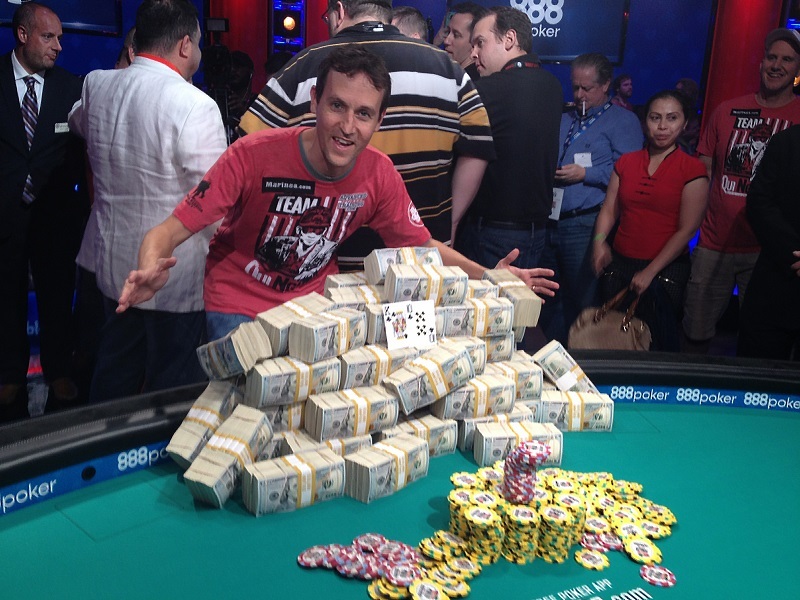 Overnight I went from a guy with a poker website, to “personal coach to the world champion”. I have some amazing connections in Las Vegas now. My wish for TommyGun: that if this was in fact destiny, that he will ponder what this all means, and what he is being called to do next. He’s already given a significant portion of it to charity; perhaps there is more to be done along those lines. Or maybe this is just a chance for him to make a better life for his extended family, even those still back in Vietnam. I hope for all the best for him, and I look forward to seeing him and his family on my next trip out to Las Vegas. Hey Steve, this is just such a great cool story, inspiring! Common man living the dream, we all love that. And…. your training site is so cool, I don’t want to share because they’ll all get too good! Live the dream and enjoy, all the best to you and your family.